The whole hole has been wholly bunged #narrowboat #england #barbridge – The Diesel-Electric Elephant Company. Well, I didn’t get soaked on my perambulation, thank you very much, so ner ner ner ner ner, and other adult expostulations. We do at least though know now what happened to Biggles. James Bigglesworth and Algernon Montgomery Lacey flew into the mysterious light and were never seen again. The Cardinal and I moved a bit yesterday. A tad over six miles, through one lock, via the usual offices, turned, called in at some “das 3 hours and no moren” “stop and shop” moorings, and then back down to a mooring where there is generally a decent mobile interwebnet signal. I must say that the lock ladder on Her Majesty’s 11′ 3″ deep lock at Cholmondeston is exceptionally slimy at the moment, although less so now, because I cleaned it up with my sweatshirt and jeans. I think that the “You will stop and shop or we will open fire” moorings are meant to encourage folk into the Cheese Factory shop. They do sell a mix of stuff there, and at the little petrol station grocery ripoffski a few hundreds of yards farther along and across the cute, cuddly, warm and welcoming A51 roadway. 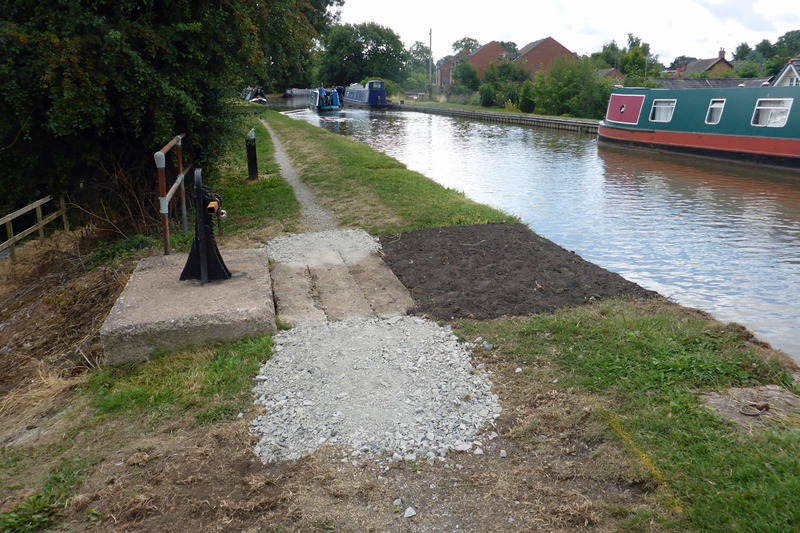 Repairs have been completed at Barbridge, although whether temporary or permanent I do not know. Father Nature will tidy up the scene quite quickly now that we are having some of “the rain, yes indeed, Myffanwy”. I think the repairs were managaed without having to close off that section, which is what are nice, isn’t it? Ruddy well done to the foot-soldiers of CaRT, ruddy well done indeed. There is no sound of gushing water anymore, so let’s hope that situation prevails. The Cardinal is now back to “Condition Green”, with that which ought to be empty being empty, that which ought to be full being full, comestibles aboard and a new (old) mooring to enjoy for the weekend. There’s even a tank of hot water, due to the engine running, that will see me through to “nicely warm water” about three days’ hence. The battery bank has had a taste of something other than solar attention; a few hours of being fed voltage-titbits and tasty electron-morsels by the alternators. The alternators are of a different charging modus to the solar panels, being of more beastly grunt and, in terms of electronic “brain” control, less sophisticated, less clever. This variety is good for the batteries every once in a while. The sky has decided to persist down, precipitating heavily as I type this, and the poor hire boaters are cruising past, determined to enjoy themselves. Atcherly, so long as my specs stay dry and I can (thus) see where I am going, it is an odd sort of fun to cruise in the rain. The trick is to just accept that you’re going to get soaked, and to get on with it. Today, however, I am aboard, inside, and the rain is pattering on the canvas covers and making a very pleasant sound. My perambulations are done for the day. I took the opportunity for a couple of hours of practice at the guns while out in the Channel… The Cardinal makes about fourteen knots wiith all sails set and my pocket handkerchief held in the wind. A good old English Curry sounds right, Ian – Glad the ‘ole is fixed, it’ll give the rain, and runoff from the fields and canal walkways, a chance to top up the canal water levels. We’ve been getting the odd yacht sailing past our place (and we’re 16 miles from any water) it’s been raining so much, plus a light show (lightning) and sound effects (rolls of thunder). Glad for the “fixings,” whether permanent or not…. Good for not getting soaked! And also great, to not have the beastly sun, blazing down on you. And super-good, to not be on vacation! And having to _act_, like you are enjoying everything. I’m glad the locks are no longer leaking in that particular place. Although based on this blog’s reporting, I suspect there are more than enough OTHER places that they are still leaking.